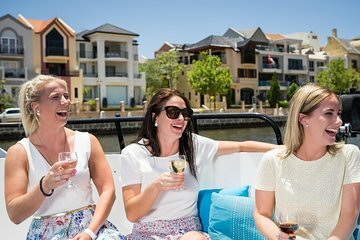 Your day cruise starts in central Perth, where you’ll hop aboard your boat and set off up the Swan River, a scenic waterway that stretches from the city into Western Australia’s Swan Valley wine region. Enjoy morning tea on board, followed by a wine tasting of premium ‘wines of the month’ from regional vineyards, accompanied with Blue Cow cheese and biscuits. As you listen to narration about the history and geography of the river and valley, admire views of Perth’s suburbs and the picturesque scenery outside the city. Hop off the boat at Sandalford Estate, where you’ll take a winery tour and watch a film presentation before enjoying a wine flight of six estate wines. During the tasting session, your 2-course lunch will be served so you try the wines with the food to decide which is your favorite to accompany your main course. Finally, browse the gift shop for souvenirs or purchase any bottles you’d like to take home before reboarding the boat to cruise back to Perth. The return journey includes more wine tastings, as well as afternoon tea with cake and live entertainment. Your cruise ends when you arrive at the departure point. See the Itinerary for a sample menu. • A child meal is included for children age 4 - 14 years traveling on a child's ticket. Wonderful day. Great Wine and food at Winery was delicious. Nice food on the boat also. The young lady who sang and entertained us was very good. Worth the money. A relaxing river trip and winery tour but lacking in pazazz. Great day to spend in a boat cruse to Swan Valley with wine tasting and nice lunch. Life entertainment on the boat as complimentary and a tour about wine making. Crew helpful, on board entertainment good. Sometimes direction from crew was a bit confused when groups were splitting up. But overall things went smoothly. Would reccomend a friend. A great trip and and very informative. The cruise was fun, there was a lot of wine, the lunch was very nice and the entertainment was entertaining. We found that the red wines of the region are not so good and information is always a good thing. I would highly recommend this cruise to any marginally serious wine lovers and all those who just love to drink wine. A great day out. We took family from the UK and they loved seeing the sights of Perth. The wine tasting was informative as well as delicious.